The keyboard hands project started with the idea of a novel keyboard with only twelve buttons. From the beginning, our idea was to create a keyboard that could be held with both hands and would be intuitive and easy to use. The first thing we did as a team was to come up with a design for our keyboard hands. 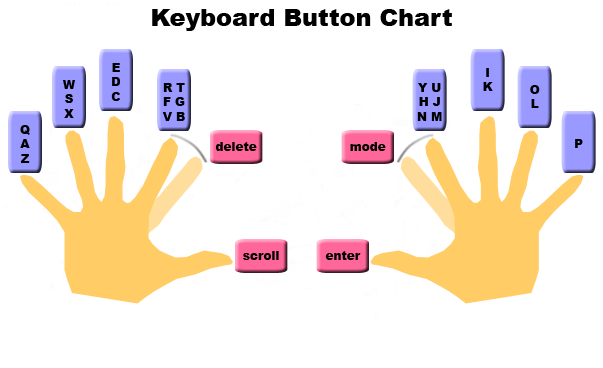 We saw that when we pretended to type on a QWERTY keyboard in the air or on a table, we used the same fingers that we would normally use on a physical keyboard to type in the corresponding letters. For example, we used the left pinkie finger to pretend to type A, the left ring finger to pretend to type S, etc. Noting this, we thought of making a predictive text keyboard that would predict the text a user wanted to type based on the sequence of fingers that the user pressed. Our first idea was to make a keyboard glove with bend sensors that the user could wear and type in the air. We abandoned this idea after it was pointed out to us that people's hands will respond differently to the bend sensors and that there is no one-size-fits-all glove. Our next idea was to create a pair of "keyboard hands," or a pair of mouse-shaped typing devices that could be held in a user's hands and could be used anywhere: on a table, in your lap, or in the air. These keyboard hands could not have very many buttons, or the purpose of an intuitive, portable keyboard would be defeated. With these ideas in mind, we set out to create a typing system that would be predictive, similar to the T9 system in a cell phone, except we wanted to use the QWERTY system of typing instead of having the cell phone system of one button representing a, b, or c, one button representing d, e, or f, and so on. Now that we had this idea, our next step was to decide the physical form that our keyboard hands should take. We wanted our keyboard hands to be one-size-fits-all: people with hands of different sizes should be comfortable typing on our device. Also, the buttons on our device should have a good tactile response, as this is the most prominent thing that a user notices about a normal keyboard. Our first prototype was a hand mold made out of model magic. 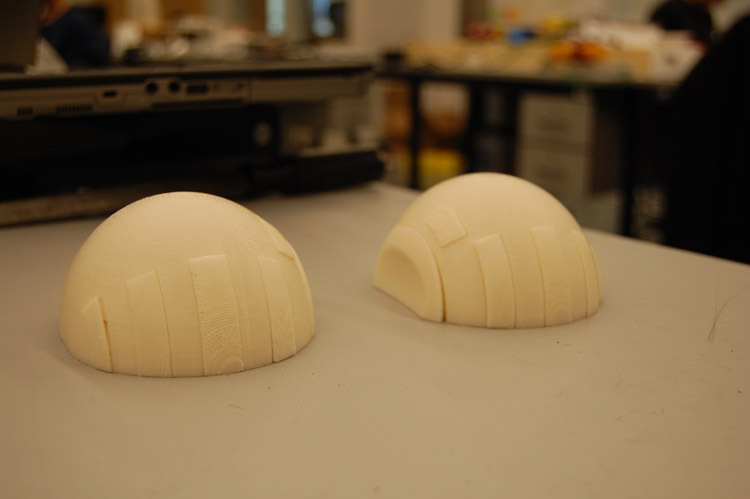 When we made this mold, the professors suggested that we measure the 3-D profile of the hand with the mill, model the mold in Solidworks, and then send the computerized mold to the rapid prototyper machine. Unfortunately, due to the not-smooth nature of Model Magic, the Solidworks model of our mold was ugly and impossible to work with. After that experience, we just decided to create a "keyboard hand" in Solidworks from scratch, using the basic dimensions of the Model Magic hand mold. Our original idea was to have little indentations for each finger, but we decided that this was not necessary. 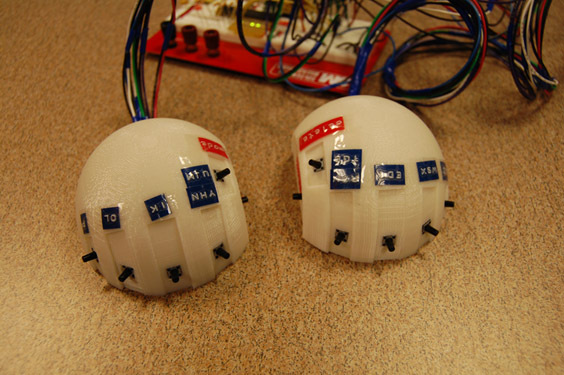 The new model that we created had little plastic covers over the push buttons that were intended to mimic the design of a mouse, but after we had trouble trying to affix the covers over the physical switches, we decided it was easier to just have the users press the bare switches. We also discovered that the bare switches had a better tactile response than the switches with the plastic covers. We then decided that we should tell our users which buttons do what, so we affixed labels to the keyboard hands.